Happy Thursday MCT Peeps! I hope you guys are having a fabulous week so far! 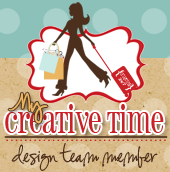 For todays challenge our fabulous design team members Liz and Shar came up with this awesome idea! They asked use to use our scraps to make a card for charity or to support an organization or person. SO, I made this card for the family of a fallen officer in our area. This was a tragedy and my heart goes out to the family of the officer and his fellow co workers. 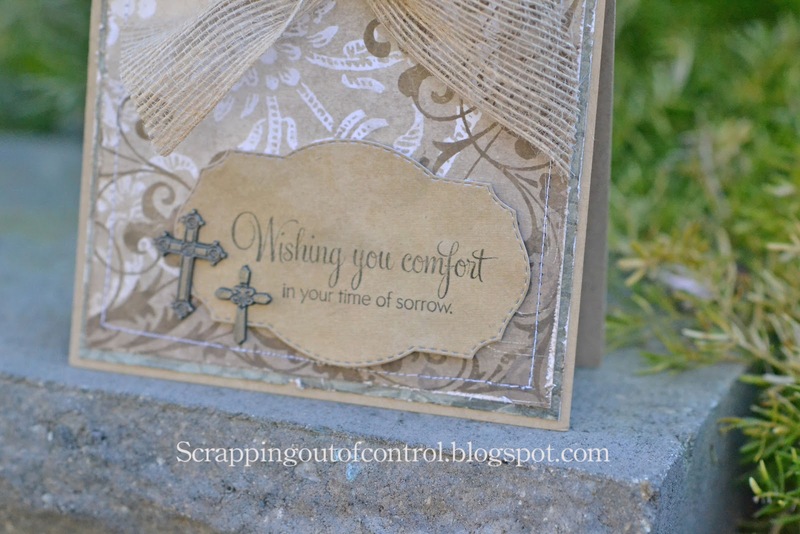 I know a card cannot bring much confront to a grieving family but I wanted them to know they are in our prayers. For my card I used mostly left over items so I cant really give you a whole lot of info. 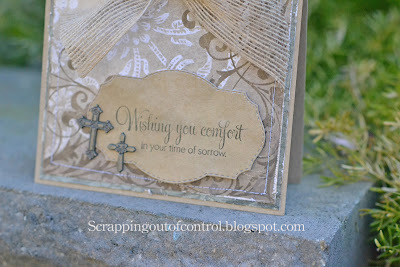 I did use Liz's Paper Loft burlap ribbon (which I love) and of course Miss Emma's stamps. This sentiment is from the Floral Sentiment set. I distress the edges of the paper and then ran it through my sewing machine. The crosses are from the jewlery section at Michael's. I know we were supposed to use scraps but this card was truly made from love! And I had such a hard time making it! Thank you for stopping by today. I thought this was a great way to give back and think about others in our community. Make sure you visit the rest of the design team. Big crafty hugs! Your card is so beautiful and definitely will be received with your warm and gentle touch that goes with it. The fact that you put your heart and soul into it makes this card what it is. Great card for a VERY sad occasion. Our service personnel are so appreciated and when one falls, we all suffer! Awesome job on this...I imagine it was difficult to make! Nancy ~ not only is this card GORGEOUS but I am sure it will warm the fallen officers families heart! Such beautiful touches at the PERFECT places and that sentiment says it best! I will pray for his family and his co~workers! What a BEAUTIFUL thing to do! I know how hard these cards are to make! Hugs! Your card will be appreciated I am sure. 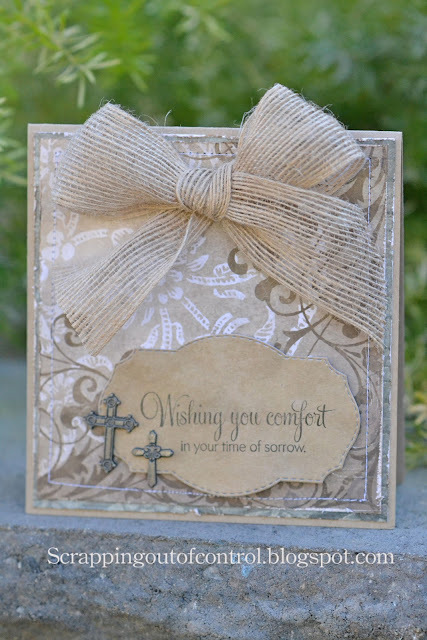 I love the way all of the brown tones look together...perfect for a sympathy card. Your card is very lovely! nancy, your card is beautiful! I know the family will love your card, I hope it comforts them. WOW! Your card is AWESOME!!!!!!!!! Great job my friend!